Welcome to How To Relieve Stress Naturally! Do You Think That Stress or Anxiety Might be Impacting Your Health? Your Relationships? Your Quality of Life? Hi, I’m Dr. Anne Taylor, and I have created How To Relieve Stress Naturally to serve as a platform for sharing cutting edge technologies as well as time-tested strategies for relieving stress—naturally. I review what technologies, strategies, and products work best for natural stress relief and what tends to get in our way. In our modern world, we’re all impacted by stress—I know I have been! I have grouped stress relieving strategies into a few basic categories, because relieving stress naturally is not a “one size fits all” kind of deal. If you’re like me and like techie stuff then the HeartMath® approach (HRV Biofeedback) will likely appeal to you. Everyone can benefit by learning stress-relieving breathing techniques (pranayam), and some may love yoga. Energy-based techniques and products are cutting edge and age-old, be sure to check those out. Let’s not forget nutritional basics, including herbs and Ayurveda, foundational to relieving stress naturally. If you’d like to share natural stress relieving strategies that have worked for you, please feel free to share them with me so that I may share them with others. While still in my youth I worked in my local community hospital as an EKG tech where I witnessed many people dying of heart attacks, right in front of me. I was inspired to pursue a career in Clinical Chemistry and later went into the field of Heart Monitoring (medical devices) where I became a director of engineering. We designed and manufactured heart monitoring devices for seriously ill people, including heart attack survivors. Our mission was to help save lives. Deep inside I knew that if people made simple life style changes they might avoid the fate of heart disease and the heart monitoring products that my teams and I developed. I started to think . . . what if we looked further “up stream” where the root of the disease sets in. Stress is one such factor, in a mix of many, that contributes to serious illnesses. I left the Western scientific model in order to research new paradigms of healing, mainly focusing on the heart. I earned a doctorate in Mythology/Depth Psychology so that I could learn what the Ancients knew about the heart and nervous system–what they meant by the “central tuning string” of the body, and how the heart is more than a pump. Ancient cultures understood the mind-body connection and the importance of getting into your body and out of your head. I have been amazed by the sophistication of Kundalini Yoga and Meditation (as taught by Yogi Bhajan) and it has served as one of the cornerstones of my personal stress practice for years. HeartMath® technologies have also become my daily companion and I appreciate the science-based data that it generates. I will always have one foot in the world of science and the other in the more Eastern-based practices. I love both worlds. My mission at HowToRelieveStressNaturally.com is to share my wisdom and years of experience with you on How to Relieve Stress Naturally through blog posts, videos, product reviews, and sharing phenomenal technologies that are natural, cost effective, and will have a real impact on the quality of your life. Like many people, I have lost loved ones to heart disease. My mother passed away from heart disease while she was still in her prime years. Much of my life has been dedicated to heart monitoring products, and yet I now understand that we all need to actively participate in our wellness and to take responsibility for getting a handle on chronic stress. So many simple changes can lead to dramatic positive results. Now that I’m in my mature years myself, I “walk my talk” and have personally benefited from the tips and technologies that I share with you on this website. I offer plenty of free links, reference links, and product reviews personally done by me. Left nostril breathing to relieve stress naturally. It is important that people actively participate in their physical and emotional well-being, to the extent that they are able to do so. Resources such as this one are here to help you find healing modalities designed to be integrated with your current healthcare. A short daily practice of yoga/meditation, for example, helps relieve stress beautifully. I get that not everyone is into yoga and I offer many other strategies and products to choose from. Why not consider exploring these options to augment your current health care regime? Peruse the site and see what speaks to you. My goal for HowToRelieveStressNaturally.com is to provide you with an array of tips, techniques, and products that are effective in relieving stress naturally. 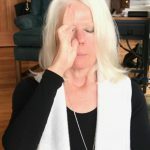 I have included many stress relief solutions for the evidence-based person as well as people more comfortable with using technologies from Ancient Traditions. My hope is that you never have to be a patient on critical care life monitoring devices that my engineering teams and I used to design! Thank goodness for Western medicine, but my goal is for all of us to participate in our own wellness and stress relief is an excellent place to start. As the former Senior Director of Product Development for an international medical device company specializing in heart monitoring, Anne is well steeped in the scientific method and highly value evidence medicine. However, she also believes that Western medicine can be even more powerful when it “makes room on the throne” for traditional sciences, including the yogic traditions. Anne holds a B.S. in Medical Biology from S.U.N.Y. and a Ph.D. in Mythological Studies with emphasis in Depth Psychology from Pacifica Graduate Institute. Her doctoral dissertation is entitled: Medical Humanities: Speaking to the Cardiologist through Myth and Metaphor (2010). The human heart is her passion and she appreciates the fact that it is more than a pump. Anne views the heart as an organ of perception which is more powerful than many people realize. She shares these explorations with you at HowToRelieveStressNaturally.com. I am a former board member of the C. G. Jung Society-Seattle, a licensed HearthMath® provider, a certified KRI Kundalini yoga instructor, and a member of the 3HO Global Foundation. If you would like to stay informed about new research, products, and technologies on How To Relieve Stress Naturally, please sign up for our newsletter. If you have any questions or would like to get into contact with me please leave me a message on the Contact Form and I will get back to you within 48 hours.